Nathan Smith has gold fever. He caught it when he picked up a book on American treasures and read these words about a mythical Spanish barkentine and its gold and silver lost in south Texas: "Whoever finds either of these treasures would possess wealth beyond imagining." 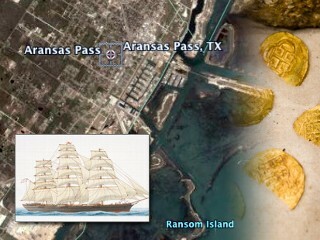 The Los Angeles musician started hunting for the ship -- legend has it blowing ashore south of Refugio, Texas, during a hurricane in 1822. His search started with Google Earth. What he saw when he zoomed into a spot north of the Aransas Pass prompted him to get into his car and drive non-stop to Texas. He got out his metal detector and Smith said, "I got readings, which indicated gold and silver." The problem for Smith, if a ship does exist, is that it is on private property. The family that owns the property doesn't want anyone digging up the land for a ship no one has proved even exists. Author and explorer Tom Townsend believes the ship, or the legend, at least, is real. "It has been my experience, more times than not, a legend like this there is some basis of truth. Because it has been around long enough that they have named Barkentine Creek, Barkentine Creek. That alone makes me think that there was, or is, something buried out there."